Free your feet from debilitating heel pain! The partial plantar fascia release procedure offers a low-risk and effective surgical treatment option for plantar fasciitis which has not responded to standard care. Plantar fascia surgery is performed as day surgery in Perth under local or general anaesthesia and takes approximately 15 minutes. 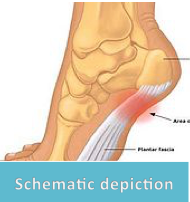 A small incision is made on the instep of the foot, and the tight band of the plantar fascia is identified and released. Patients are usually permitted to weightbear immediately after surgery and return to normal activities within a few weeks. The treatment is usually definitive, and patients may experience relief of plantar fasciitis symptoms shortly after surgery. For more information on plantar fasciitis surgery in Perth, we recommend making an appointment to see our specialist podiatric surgeon Dr. Andrew Knox.